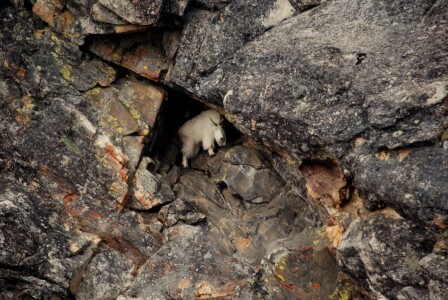 Exhausted and completely out of energy, the mountain goat (pictured above) sought refuge in a cave on the rocky cliff he had scrambled up just minutes earlier. He had abandoned the thick, green, rain-soaked grass, which had proven to be quite the Sunday dinner, when he saw two whitetail does running full speed at him. Their tongues were hanging out of their mouths and their eyes were bulging wide open with panic. Unsure of what was chasing the deer, but in no real hurry to move, the goat left his grass buffet and headed closer to the rocky mountainside, where he felt the most comfortable. The goat knew that whitetails spook easily, so he wasn’t too concerned with what was terrifying them. Heading back to the rocky cliffs that doubled as his comfort zone, the goat stopped on an asphalt road. He couldn’t resist sliding his tongue over the salty glaze, which was residue from a combination dried road salt and rain water, that coated the road. All of the sudden, his road-licking bliss was interrupted by the sound of some rustling. He looked up just in time to see a mountain lion headed full-speed toward him. Without hesitation, the goat whipped around 180 degrees and scrambled as quickly as he could to the jagged rocks, hoping that he was fast enough to leave the cougar far enough behind him. That was not the case…the cougar lunged at the goat as he reached the base of the rocks, but couldn’t quite get a grip on the goat’s back, so he slipped off, and the goat quickly and expertly maneuvered his way up the face of the rocky mountain and headed toward the only opening in sight. His goal was to get to the cave and back in, using his horns to deter the cat, hoping it would not want to work that hard for this particular meal and move on and look elsewhere. It was a risky plan, as he knew the cat was determined and could move quicker than him, but the goat also knew he had an advantage on the rocks. Not knowing where the cat was and realizing that stopping in the cave could be a death wish if the cat was still right behind him, he kept moving. When he made it to the ledge, he backed in, keeping his head down so his horns were where he estimated the cat’s eye-level would be. He waited in the darkness of the cave. After a good five minutes of hearing nothing, the goat peered out from his temporary “safe house”. From what he could tell, he was alone, but he ventured out a bit further to confirm this assumption. And that was when the photographer captured this picture. Or is it? Okay, so I am not sure if that is what happened, nor do I even know who actually took this picture, but it could be a possible scenario option. A friend emailed me this picture and asked me if I could share it in a post, so I figured this would be a good way to do just that. Let us know what you think this goat’s story is.